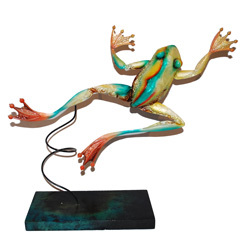 This attractive, hand-painted work of art can be placed in nearly any setting. Handcrafted from metal and adorned with mother of pearl then hand-painted and sealed. The piece is set on a wooden block base.